In order to provide you with our interactive services, Talk Cafe collects, uses, and shares certain information about you. This policy explains what we collect, with whom we share it, and how you can interact with Talk Cafe in order to ensure the accuracy of the data we collect, use, and share. The information Talk Cafe collects from you helps us better serve the online and SMS Text community. We learn about you through the information you provide to us when signing up for, or using, our services. You may be asked to provide some personal but non-identifying information to complete your profile. This information is not linked in any way to your personally identifiable information for other to use. The information you provide ranges from basic contact information to payment information. You agree to provide accurate and complete account information and update your information when it changes. In general, you can visit the Site without revealing any information about yourself that could identify you personally, such as your first and last name, postal address, email address, and telephone number(s) (“Personal Information”). Talk Cafe will not sell or rent your Personal Information to third-parties for any purpose without your consent. Talk Cafe receives and stores all information that you enter on our website or Interactive Voice Response (IVR) systems. This may include; a) your first name, your last name, your address, your city, state/province and zip/postal code, your country, and your agreement to be bound by Talk Cafe’s terms and conditions. You are obligated to provide Talk Cafe with accurate and up-to-date information, and failure to provide Talk Cafe with such information could void any Agreement between you and us. We use the information that you provide for such purposes as processing your purchase request, responding to customer service inquiries, loss prevention, improving our service and communicating with you. Talk Cafe receives and stores certain information whenever you download our web page or call our IVR services. When you use the Site, our system automatically gathers information about the nature of your usage of our service. This type of data may include: (i) IP address; (ii) domain server; (iii) type of computer or handheld device; (iv) type of web browser; and (v) telecommunications carrier (“Traffic Data”). Traffic Data is anonymous and you will not be personally identified from this information. We have put in place appropriate physical, electronic, and managerial procedures to safeguard and help prevent unauthorized access, maintain data security, and correctly use the information we collect online. Talk Cafe and its employees who have access to personally identifiable information are required to protect this information in a manner that is consistent with this Privacy Notice by, for example, not using the information for any purpose other than to carry out the services they are performing for Talk Cafe. We will take all reasonable measures to protect your personal information. In the event of illegal activity, we reserve the right to release account and personal information in order to comply with all local, state and federal law enforcement agency’s requests. This may be in the form of an affidavit, a properly issued subpoena, or order of the Court or to protect the rights, property, or safety of Talk Cafe. This includes exchanging information with other companies and organizations for fraud protection and credit risk reduction. Visitor information is not disclosed to anyone except to Talk Cafe personnel who need the information in order to respond to a request. Although we take appropriate measures to safeguard against unauthorized disclosures of information, we cannot assure you that personally identifiable information that we collect will never be disclosed in a manner that is inconsistent with this Privacy Notice. Talk Cafe may engage a trusted third party to perform functions on our behalf (such as fulfilling newsletter subscriptions, sending requested postal mail and e-mail communications, analyzing data, and providing customer service). These third parties may have access to Traffic Data and Personal Information needed to perform their functions, but we do not permit them to use it for other purposes. We may share aggregated demographic information with our sponsors. This is not linked to any personal information that can identify any individual person. We may also use an outside company or companies to process payments or to fulfill orders. From time to time, we may contract with another party to provide certain specific services to our users. If we have collected your personally identifiable information from one Site, that Site may share the information with other Sites within our network in order to provide you with additional goods and services for which we believe you may be interested. Except as provided above, we do not currently sell or otherwise make available personally identifiable information about our users to third parties. Nevertheless, we reserve the right to make such information available to third parties in the future in order to enhance and personalize our services, or in the case of bankruptcy, sale of an asset, business or division, a merger or acquisition, or similar change of ownership. We do not provide any customer information to third party advertisers for the purpose of lists or contacts. If a user’s personally identifiable information changes (such as phone number or a credit card number), or if a user no longer desires our service, you may contact us to correct or update this information. Talk Cafe does not request, or knowingly collect identifiable information from any person under the age of 18. Talk Cafe does not knowingly use personal information from users under the age of 18. Any issue respecting your children’s privacy may be directed to: Talk Cafe Inc. at the above address. The Site complies with the Children’s Online Privacy Protection Act (“COPPA”). Talk Cafe. In addition, in the event that a user identifies himself or herself as a child under the age of 18 within the Site, Talk Cafe will not collect, store or use any Personal Information of such user. Further, in the event that Talk Cafe receives Personal Information that Talk Cafe discovers was provided by a child under the age of 18, Talk Cafe will promptly delete such Personal Information in a secure manner. As a convenience to you, we may provide links to third-party web sites from within the Site. 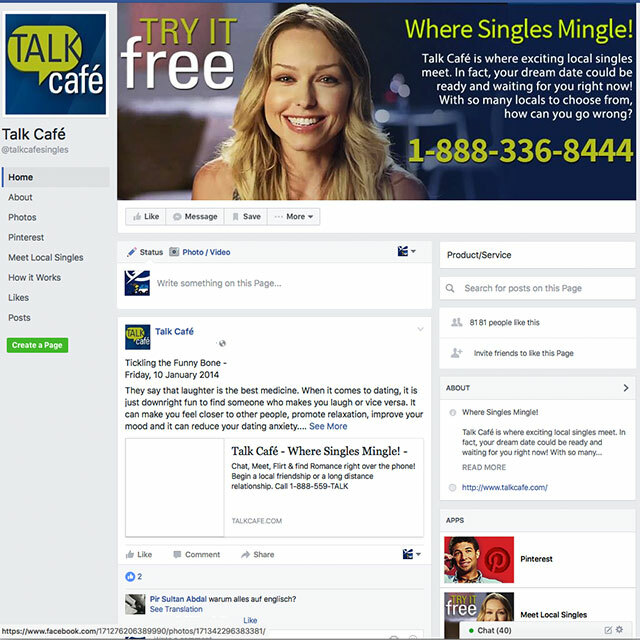 Talk Cafe is not responsible for the privacy practices or content of these third-party sites. Register & Enjoy FREE MINUTES!